France has joined Russia in declaring itself ready to veto a new UN resolution which gives Iraqi leader Saddam Hussein until 17 March to disarm. French President Jacques Chirac said his country would vote against any resolution that contains an ultimatum leading to war. Mr Chirac's comments echoed an earlier statement by the Russian Foreign Minister, Igor Ivanov, who said his country would vote against the draft resolution proposed by the US and the UK. The stance by France and Russia - both veto-wielding members of the Security Council - is a severe blow to US aims of securing UN backing for quick military action against Iraq. In a day of frantic diplomatic activity, President George W Bush has been telephoning foreign leaders in an attempt to garner support for the resolution. The Security Council resumed consultations on Monday, but the new resolution is not expected to be put to the vote until Wednesday at the earliest. He said that he did not believe the resolution had sufficient support to be passed by the Security Council. But if it did gain the necessary nine votes, France would vote against it. "France will not accept this resolution. France will vote no," Mr Chirac said. He also warned that if the US embarked on military action without UN backing it would set a dangerous precedent and lead to an increase in terrorism. "The war will break up the international coalition against terrorism," he said. Hours earlier, Mr Ivanov said the draft resolution was impossible to fulfil and ran counter to the policy currently being implemented under resolution 1441. Among the Council members reported to be undecided, Pakistan has now said it would find it very hard to support military action. And Angolan Foreign Minister Joao Bernardo de Miranda said his country is not prepared to commit itself until it came to a Council vote. 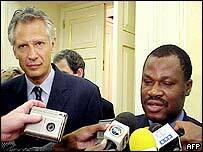 He was speaking after talks with French Foreign Minister Dominique de Villepin, who has been touring Angola and the other African members of the Security Council, Cameroon and Guinea, to try to persuade them to reject the resolution. Despite intensive lobbying over the weekend, it is far from certain that Britain, the US, and Spain, which is also promoting the resolution, have the support on the Security Council to see it passed. In another blow to the US and UK, the UN Secretary-General, Kofi Annan, has spoken out against any military action against Iraq that lacks the support of the Security Council. The members of the Security Council faced a grim task, Mr Annan said. "If they fail to agree on a common position and action is taken without the authority of the Security Council, the legitimacy and support for any such action would be seriously impaired," he said. White House spokesman Ari Fleischer said if the Security Council did not support a new resolution, it would be failing the people of Iraq just as it had let down other peoples before. "From a moral point of view, as the world witnessed in Rwanda and ...Kosovo, the United Nations Security Council will have failed once again," he said. But the BBC's Rob Watson in Washington said Mr Fleischer also indicated that Washington could be flexible over its precise wording, including the proposed deadline of 17 March - a sign perhaps of how much the US still wants a second resolution. Britain has also said it will continue to work to get a draft resolution through the Security Council to disarm Iraq by force. "My instructions at the moment are to continue working for the draft resolution, and we will to continue to do that," UK ambassador to the UN, Sir Jeremy Greenstock, told reporters. 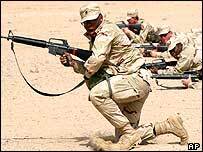 Earlier on Monday, UK Foreign Secretary Jack Straw insisted that Iraq was not being asked to disarm within a week. "But what we are expecting is that the Iraqi regime should demonstrate the full, unconditional, immediate cooperation demanded by successive resolutions since 1991," he told MPs. To that end, Mr Straw said the UK Government wanted to draw up a list of tasks for Iraq to show it was serious about disarming. 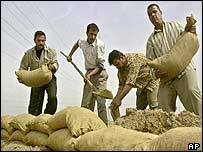 The detailed disarmament moves are likely to be drawn from a document compiled by UN chief weapons inspector Hans Blix which says Iraq has not fully disposed of its chemical and biological weapons arsenal. "The real action continues to be the intense bargaining behind the scenes"